Turkish Foreign Ministry spokesman Hami Aksoy delivers a speech during a press conference in Ankara, Turkey on April 12, 2018. Turkey on Tuesday slammed an Arab League resolution calling for an end to Turkey’s military operation in Afrin, northwestern Syria. 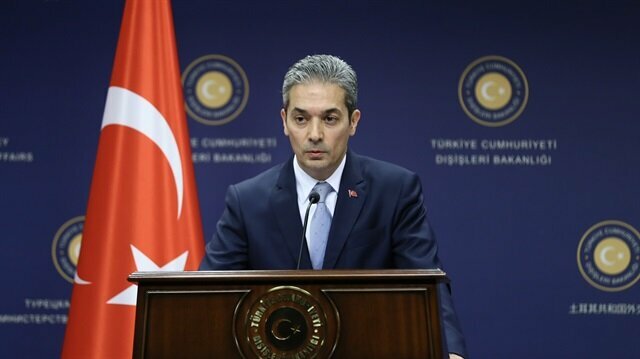 In a statement, Foreign Ministry spokesman Hami Aksoy said the league ignored Turkey’s work to reduce violence, maintain the political process in Syria, and provide a home to millions of displaced Syrian refugees. On Sunday, the Arab League passed a resolution calling on Turkish forces to withdraw from Afrin, claiming doing so would help efforts to solve the Syria crisis. Aksoy said Turkey’s Operation Olive Branch in Afrin is a self-defense operation against the terrorist organizations trying to divide Syria. Turkish Armed Forces along with Free Syrian Army (FSA) fighters continue to search and clear the landmines and other explosive devices in order to strengthen security in Afrin, Syria.Turkish troops and FSA have launched a new operation to search for tunnels and hideouts in the Hasan Deyra mountain near Afrin’s Bulbul district. "As FSA, we are in the search activities with our brothers from the Turkish army," Abu Jumma, an FSA commander, told Anadolu Agency. "We will find and destroy landmines planted by terrorists in the region for the safe return of civilians into Afrin," Jumma said. Turkey launched Operation Olive Branch on Jan. 20 to clear YPG/PKK and Daesh terrorist groups from Afrin in northwestern Syria amid growing threats from the region. Since then, hundreds of thousands of people have been killed in the conflict, according to UN figures.